When you think of art sponsored by and displayed in a hotel, chances are what comes to mind is easily digestible work plopped in the middle of the building’s existing life. True disruption is costly, time-consuming, and often at odds with the primary function of a hotel. Which is what makes The Peninsula’s new “Art in Resonance” program, which opened during Art Basel in Hong Kong, so noteworthy. Curated by Isolde Brielmaier and Bettina Prentice, it features immersive installations by Janet Echelman, Ivan Navarro, Timothy Paul Myers, and the Shanghai-based architecture collective MINAX. Each breathes new life into the five-star hotel’s posh existence, inviting visitors, guests, and passers by to rethink what it means to live alongside art. Echelman’s work, in particular, disrupts not only the building’s facade, but its ability to be used as originally intended. Earthtime 1.26 resembles a giant technicolor fishing net draped over the front of the hotel. Two corner suites as well as a large poolside outdoor balcony were sacrificed in order to install the piece, which looks impossibly light but is actually held in place by a military-style truss bridge, among other things. 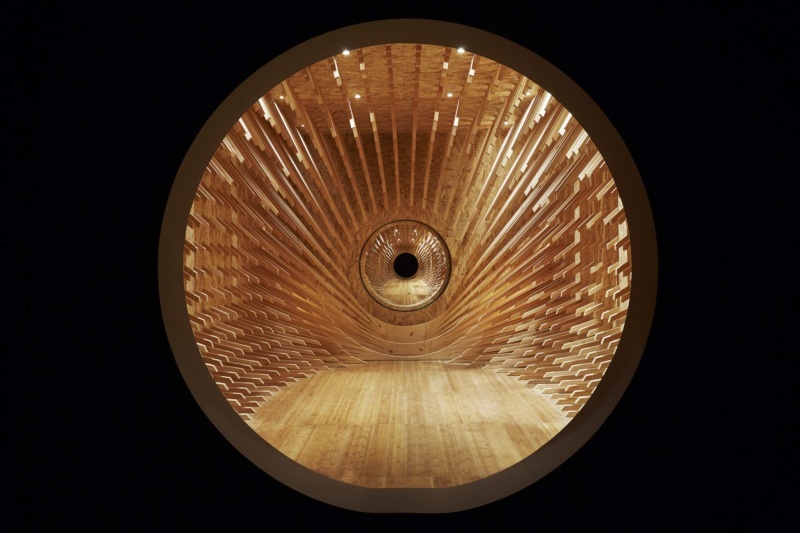 Similarly, MINAX’s The Wonder Room, a wooden structure based on a traditional Chinese tea house that takes on a transcendent quality when used for regularly scheduled gong-based “sound baths,” required the hotel to use one of its ground-floor retail spaces, previously occupied by a high-end jewelry brand. Guests who might be confused as to, for example, why they can’t use the balcony or what that thing hanging off the building is, are provided with literature about the art, as well as a complimentary spread of chocolates inspired by the program. 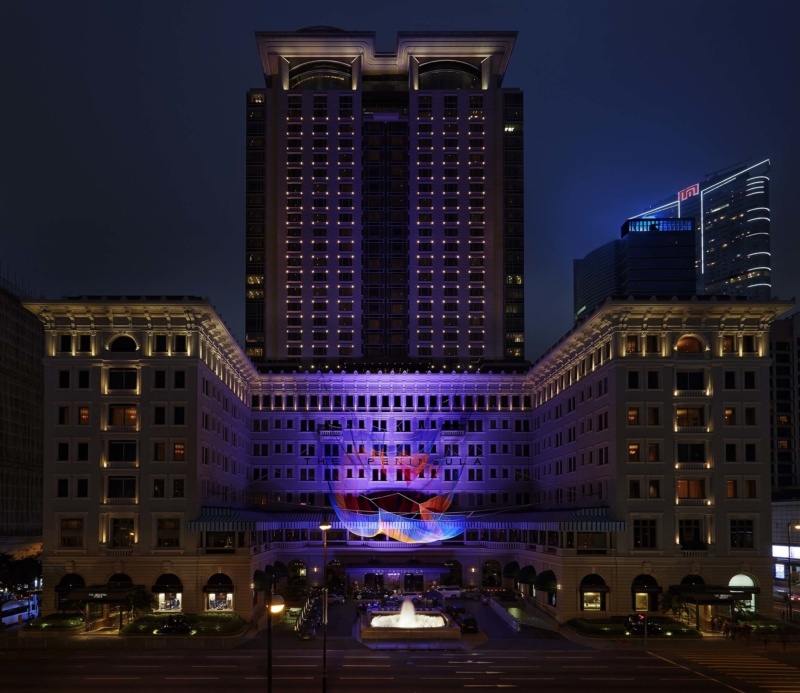 The Peninsula Hong Kong features Janet Echelman’s installation Earthtime 1.26. The concept of art as a universal language, while a bit cliched, is fitting in this environment — not just because it houses people from all over the world, but because the so-called “Grand Dame of the East” represents a dying breed of old world hospitality, which has to find ways to remain relevant to a new generation of travelers with very different values than those previous. In this way, “Art in Resonance” feels like a model for how to do corporate-sponsored contemporary art in a way that feels authentic to the viewer and beneficial to all parties involved. The fair compensation of the artists, for example, was agreed upon from the start. Indeed, after the program wraps up at the Peninsula Hong Kong on June 21, it will travel to Paris, then Tokyo, and eventually to other locations in the hotel’s portfolio, with new works by local artists to be added in each. Artists will travel to each location to ensure proper installation.